Did Obama Change Military Funeral Protocol? David Emery is an internet folklore expert, and debunker of urban legends, hoaxes, and popular misconceptions. He currently writes for Snopes.com. Online rumor alleges that U.S. military funeral protocol has been changed such that when the folded flag is presented to relatives of the deceased, it's now done "on behalf of the Secretary of Defense" instead of "on behalf of the President." After the service I approached the soldier who presented the flag to my aunt to inquire about the change in language . His response was "The White House notified all military funeral service detachments to immediately remove 'the President' and insert 'the Secretary of Defense'. I couldn't believe what I heard and the soldier smiled and said "You can draw your own conclusion sir but that was the order". He, too, was ashamed of what he was required to say. This president has taken off the gloves. My only response to this endless cesspool of Anti-American rhetoric dripping from his mouth is to borrow a phrase (with one minor change) uttered by another temporary Washington resident living in government housing: "Today for the first time in my adult life I was ASHAMED of my country". I did not serve in the military but my love of country parallels that of people like my late uncle who bled Red, White and Blue . As a second generation Serbian-American who's heritage produced many patriotic military men and women who fought for freedom both in The United States as well as in the former Yugoslavia (most recently in Kosovo against the slaughter of Serbs by Muslim extremists ) I implore you to make the American people aware of this little-known or, at least, publicly acknowledged fact. May God Bless you and your family during these difficult times . Your voice of reason is a welcome change from the insanity plastered across the country by the liberal media. Keep up the great work and t hank you for your service to our country. Analysis: The author of this email, John G. Martich, has confirmed writing it and says the events took place as described. We may as well take him at his word. Martich's claim that he witnessed a departure from the standard wording of the flag presentation ceremony at a U.S. Army funeral isn't controversial. What is controversial, and what has prompted so many people to copy and share this message in anger, is his broader allegation that the White House ordered a change in official protocol such that the flag must now always be presented "on behalf of the Secretary of Defense and a grateful nation," instead of "on behalf of the President of the United States and a grateful nation." With all due respect to Mr. Martich and the unnamed soldier who allegedly told him so, it's not true. When I called Arlington National Cemetery to verify — and bear in mind, this is a facility that conducts as many as 30 military funeral services a day — I was told by staff members that they are unaware of any such revision. This flag is presented on behalf of a grateful nation and the United States Army as a token of appreciation for your loved one’s honorable and faithful service. I've found precisely that wording used in the majority of instances quoted in published accounts of Army funerals. On occasion the chaplain or presenter will instead say, "On behalf of the President of the United States and a grateful nation," or "On behalf of a grateful nation and the President of the United States," etc., but, as far as I can tell, mentioning the President in Army funeral services is the exception, not the rule. Apart from Martich's, I have yet to come across a single report of the formulation "On behalf of the Secretary of Defense and a grateful nation" being used in a U.S. military funeral. While there have been some inconsistencies at the unit level in reciting the appropriate verbiage, neither the Department of Defense nor the services have received, published or directed any recent change. 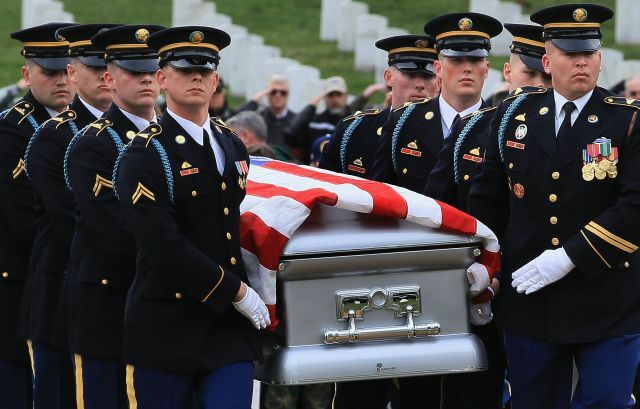 While military funeral honors often are presented at National Cemeteries, the Department of Defense (DOD) is responsible for providing military funeral honors. Each individual branch of the Armed Forces may establish its own protocol, typically issued in the service’s policy manual. This includes guidance on the statement to be recited when presenting a burial flag to the next of kin. When a VA national cemetery representative presents the burial flag to the next of kin in lieu of a member of a military honor guard, they use these words: "This flag is presented on behalf of a grateful Nation, as a token of appreciation for the honorable and faithful service rendered by your loved one." While there may be some variations at the unit level in reciting the appropriate verbiage, neither the Department of Veterans Affairs, the Department of Defense, nor any branch of the military have published or directed any recent change to the recitation for presenting a burial flag to the loved one of a deceased veteran. Change of Military Protocols for Memorials? What Happened to Barack Obama's Birth Certificate? What About Those "Commie" Quotes from Hillary Clinton? Did Michelle Obama Insult the American Flag? Did Obama Really Sign the Most Executive Orders of Any President? Did Khrushchev Warn of "Small Doses of Socialism"? Should We Worry about the 5 Nuclear Carriers Docked at Norfolk? How a Civil War General and a Brigade Bugler Composed "Taps"
Did Juval Aviv Predict a Terrorist Attack Will Occur Soon? What Does the National Security Council Actually Do?